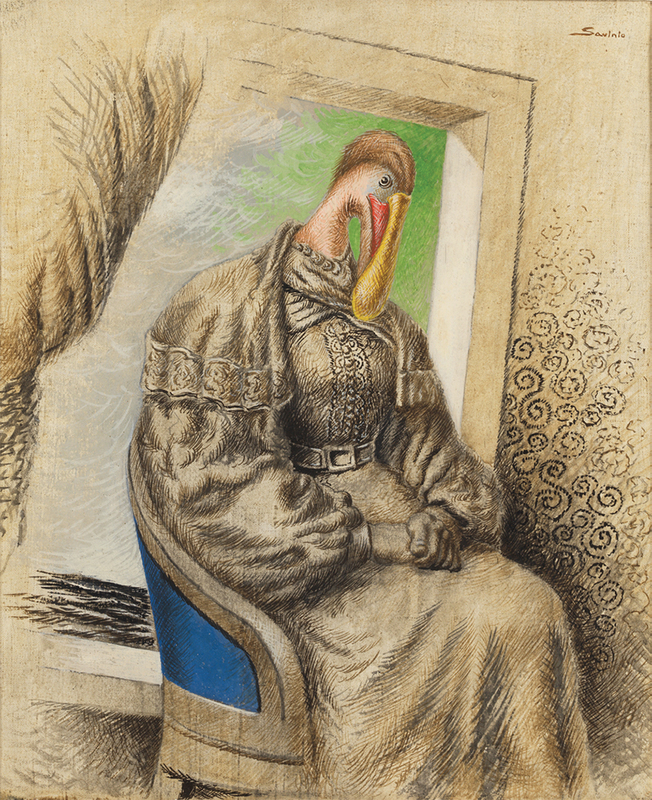 Alberto Savinio, La vedova (The Widow), 1931, tempera on paper mounted on canvas, 21 5/8 × 18". © Artists Rights Society (ARS), New York/SIAE, Rome. Alberto Savinio, I miei genitori (My Parents), 1945, lithograph on paper, 13 1/4 × 19 7/8". © Artists Rights Society (ARS), New York/SIAE, Rome. Years later, André Breton would write that the “whole, as-yet-unformed modern myth rests at its origins on two bodies of work that are almost indistinguishable in spiritby Alberto Savinio and his brother, Giorgio de Chiricoand that reached their culminating point just before the war of 1914.” Savinio must have been very shrewd indeed to realize so early that he would have to make an effort to avoid being overshadowed by his brotherif that’s what his change of name implies. He might nonetheless have been bitterly surprised to know that more than a century later he remains an unjustly overlooked figure, at least outside Italy. The fact that he spread his creativity among three fields may have had something to do with the public’s disregard. It would be interesting to know more about Savinio’s music. It seems to have fallen into oblivion. More successful in the long run was his literary career, which got off to a start in 1918 with the publication of his novel Hermaphrodito. (An earlier publication, in French, Les chants de la mi-mort [The Songs of Half-Death], 1914, was the libretto for a musical work whose costumes and scenery he also designed.) Savinio went on to produce a great quantity of brilliant writing in many genres before his death in 1952. 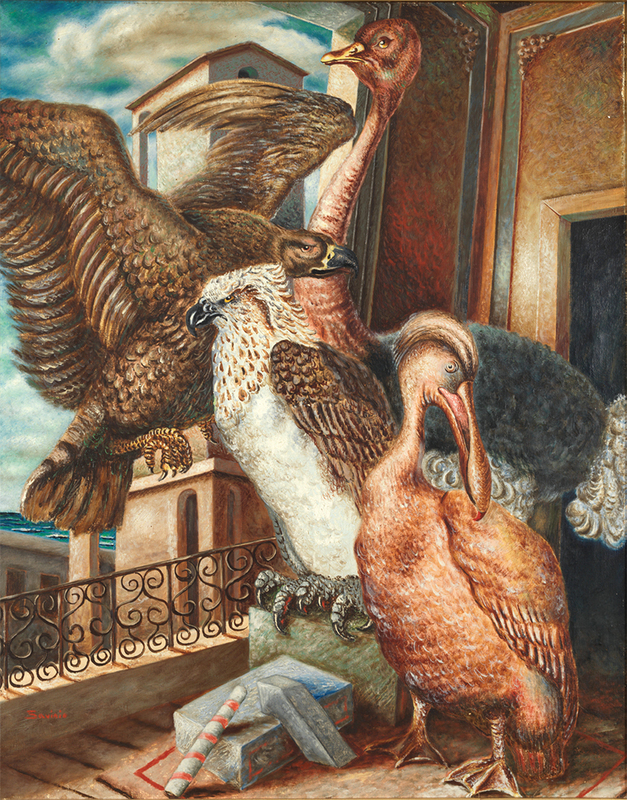 Alberto Savinio, Jour de réception (Reception Day), 1930, oil on canvas, 36 3/8 × 28 3/4". © Artists Rights Society (ARS), New York/SIAE, Rome. Painting was the third art to which Savinio applied himself, apparently not until the mid-1920s. By this time, the most creative period of de Chirico’s career was already over. As Breton, who lauded the elder artist’s early paintings, wrote in 1926: “No one wants to follow him in his wretched conclusions; as for that, the least one can say is that inspiration is totally lacking and that a shameless cynicism is flagrantly evident.” Some ninety years on, Breton’s views hold less sway without having been supersededthe later de Chirico work appears always on the verge of being revalued, but it never quite seems to happen. One might speculate that Savinio took it upon himself to pursue painting in part because of his suspicion that de Chirico had lost his bearings. He was not ready to bury himself in the old masters like his brother, nor to accept Breton’s judgment that both of their oeuvres had reached their culmination just as he was beginning to invent his own identity. Alberto Savinio, I re magi (The Wise Men), 1929, oil on canvas, 35 1/2 × 46". © Artists Rights Society (ARS), New York/SIAE, Rome. THE CURRENT EXHIBITION at the Center for Italian Modern Art (CIMA) in New York focuses on Savinio’s most productive years as an artist, with twenty-one paintings dating from between 1926 and 1932, along with just one from 1936 and a pair of prints from the ’40s. The works intertwine themes also recurrent in Savinio’s fiction, namely, the strange and melancholy nature of relationships within the bourgeois family; the porousness of the essential boundaries between human beings and inanimate objects, on the one hand, and animals on the other; and mythology as a language with which to articulate the metamorphic nature of identity. The evocation of myth also allows intimate perceptions a momentary grandeur, an implication of universal significance that Savinio always imbues with irony. These are images in which people are indistinguishable from statues (as in Senza titoloFigure [UntitledFigures], 1927) or have mutated into birds either in part (La vedova [The Widow], 1931) or entirely (Jour de réception [Reception Day], 1930). 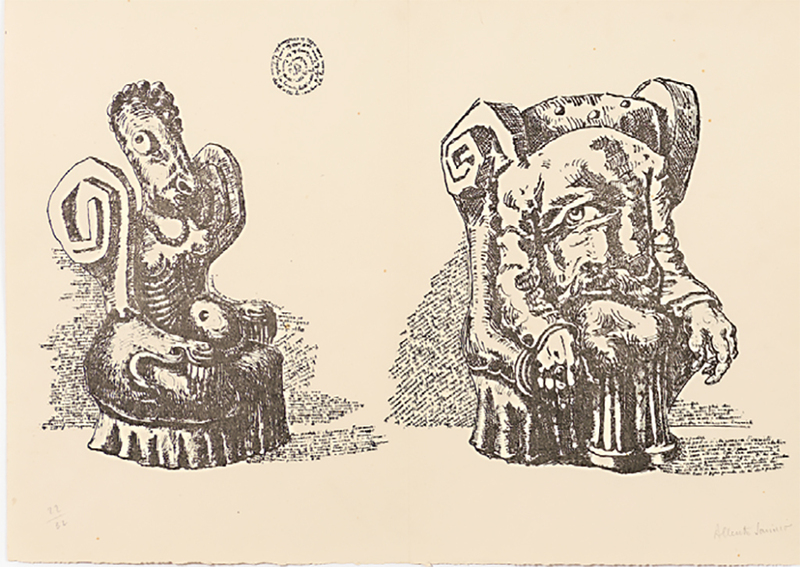 In the remarkable lithograph I miei genitori (My Parents), 1945, the grotesque and pathetic figures of Evaristo and Gemma de Chirico, who appear to have melted into the chairs that support them, are barely recognizable as human; they cast shadows that on close examination turn out to consist of micrographic writing. We can make out, for instance, the words WHAT IS THERE TO NOTE ABOUT THESE REPRESENTATIONS OF MY PARENTS? THE PERFECT FUSION OF MAN AND FURNITURE. THE TIME HAS PASSED WHEN IT WAS BELIEVED THAT FURNITURE HAD NO SOUL. 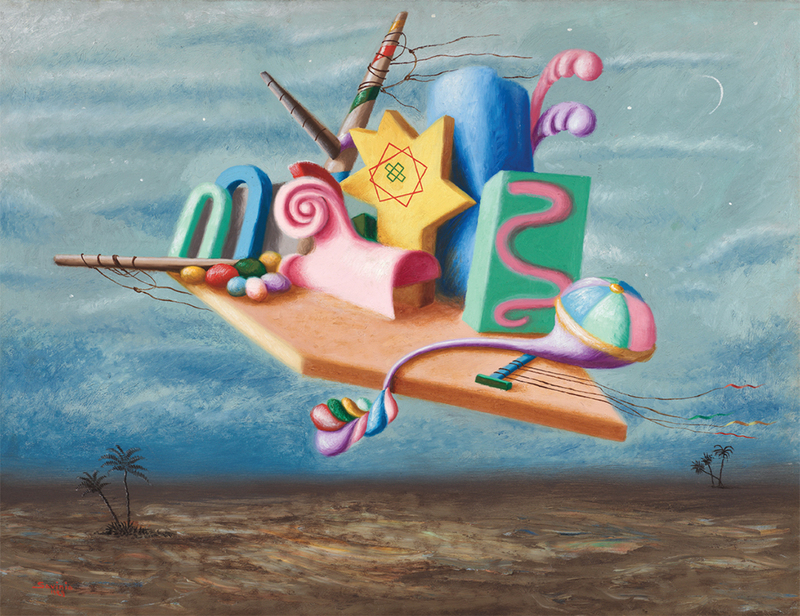 Savinio treated painting like a box of toys, some of which he loved very much, but that he nonetheless could pick up or toss away impulsively. To the extent that one can take seriously Savinio’s fusion of parent and armchair, the distinctions between figure painting and still life or landscape become problematic. More surprisingly, so does the distinction between abstraction and representation: Many of the objects depicted in Savinio’s paintings are completely fantasticalinvented three-dimensional forms portrayed as if they were real objects. In I re magi (The Wise Men), 1929, the conglomeration of colorful objectssome small egg-shaped ones, a couple that are horseshoe shaped, and a yellow starburst with some geometric glyphs inscribed on it, among otherscoasts across a nondescript landscape on a rigid version of a flying carpet; apparently these toylike entities are the three kings on their way from the East, as mentioned in the Book of Matthew. A similar clutch of multicolored forms on a desolate beachtheir concatenation this time vaguely suggesting a rubber raftconstitute L’abandonnée (The Abandoned One), 1929, implying a figure who dreams of another bunch of shapes that trail in outline against a sky full of pastel-hued clouds. In another work, these grouped objects, set up on a craggy peak, amount to a Monumento ai giocattoli (Monument to Toys), 1930, which reminds us that the belief that things have souls reflects the natural animism of childhood. Alberto Savinio, Untitled, 1929, 25 5/8 × 32". © Artists Rights Society (ARS), New York/SIAE, Rome. Perhaps this childlike sincerity accounts for both the power and the limits of Savinio’s art: He treated painting like a box of toys, some of which he loved very much, but that he nonetheless could pick up or toss away impulsively. His art is never cynical, but it could be disenchanted: Untitled, 1929, for instance, evokes the sublime only to make it absurd. Above a dark, gloomy landscape (earth all the color of mud, trees an inky blue), the sky is alive with jagged, zigzagging colors: The visionary experience that is both infantile and meaningless, yet very impressive. It reminded me of the entry “Art” in Savinio’s Nuova enciclopedia (New Encyclopedia), written in the ’40s but only published in book form posthumously, in 1977. He insists that “the kingdom of art is of this world,” and that any attempt to make it communicate with the transcendent is doomed to failure. Not spiritual but manual abilities, he says, are what the artist needs. It’s true that Savinio possessed the latter to a degree surprising in one who did not take up painting seriously until he was in his thirties; consider, for instance, how he conjures Prometeo (Prometheus), 1929, out of a skein of short, loopy, cursive brushstrokes that gather and disperse like the yarn of a sweater unraveling. And he is a remarkable colorist, with a knack for playing brightly clashing hues against monochromatic tonalities. But his technical skill is in the service of a gift for metaphor that is profoundly literary, which is to say, immaterial. The exhibition, “continuing CIMA’s practice of introducing work by contemporary artists into its exhibitions,” as its website explains, also includes several works by Louise Bourgeois. The emotionally rawer content of her mature sculpture sounds a dissonant note in the context of Savinio’s irony and melancholy, despite their shared relation to Surrealismhe a precursor like his brother, de Chirico, and his friend Apollinaire, she an inheritor of its legacyand mining of family psychology as subject matter. But her early suite of engravings and texts, exhibited in facsimile, He Disappeared into Complete Silence, 1947, from the same period as the Savinio prints here, confirms that her abstraction of the human could be in syntony with his art of everyday absurdity. 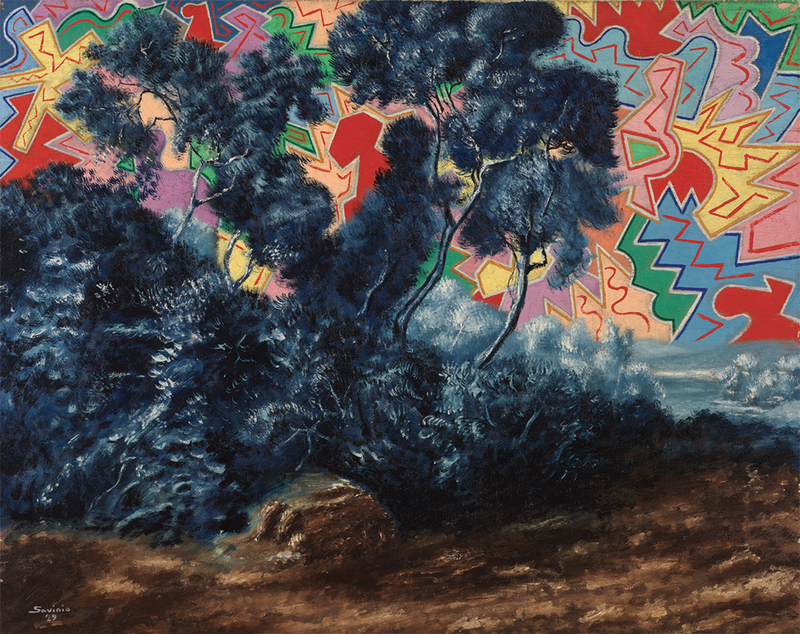 “Alberto Savinio” is on view through June 23. 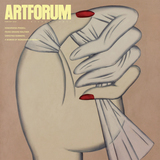 Barry Schwabsky is a regular contributor to Artforum. His new book is Heretics of Language (Black Square Editions, 2018).